In the Northern Hemisphere, winter is the coldest season of the year. It begins about December 21 and lasts until about March 21. Around December 21 or 22, the sun's rays fall directly over the farthest point south of the equator - marking the first day of winter. Winter days have fewer hours of daylight because of the path the earth takes as it revolves around the sun. The earth completely revolves around the sun during 365 days. The earth's axis always tips about 23 1/2 degrees from a line perpendicular to its path. In the Southern Hemisphere, winter begins in June. Different regions have longer winters than others. For example, in the polar regions, winter takes up half the year. In the Temperate Zones winter takes up about one quarter of the year. In regions where there is cold weather, it causes many changes in the environment. Water may freeze and become ice, snow, sleet or icicles. Most plants and animals become dormant and rest. Some animals hibernate. The only plants that grow and remain green are evergreens. People protect themselves from the cold climate with winter clothing when they go outdoors. 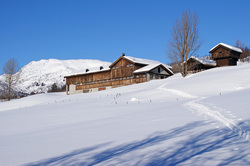 They enjoy a variety of indoor activities or outdoor winter sports such as skiing, skating, or sledding.